Since I started this challenge back in August, 2010, I've covered only a handful of short films. In Feb. of 2012, I watched 3 Dead Girls, a collection of three horror shorts directed by Christopher Alan Broadstone, and recently I saw D.W Griffith’s The Musketeers of Pig Alley, which offered a chance to explore a historically significant picture (it was the first gangster movie ever made). But, today, I wanted to mix things up a bit by taking a look at a very short film: Tim Burton’s Vincent, a 6-minute stop-motion animated movie about a young boy with an unusual appetite for the macabre. Narrated by Vincent Price, Vincent introduces us 7-year-old Vincent Malloy, who lives in a nice suburban home with his family and his faithful dog, Abercrombie. But Vincent isn’t like most children his age. “While other kids read books like ‘Go Jane Go’”, Price informs us, “Vincent’s favorite author is Edgar Allan Poe”. Preferring to think of himself as a tortured mad scientist, Vincent imagines experimenting on his dog, which he hopes to turn into a “horrible zombie”, and dipping his Aunt in wax to put her on display in his museum. His mother tells him to spend more time outside, but seeing as he’s such a tormented soul, Vincent would rather be alone, pining for the beloved wife he accidentally buried alive! Produced in 1982, Vincent was one of Burton’s earliest works, and set the stage for many of his subsequent films. 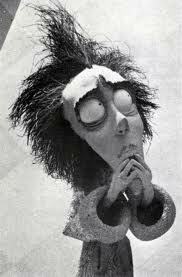 An obvious influence on The Nightmare Before Christmas, The Corpse Bride, and Frankenweenie (which were also stop motion); you can see traces of Beetlejuice and Edward Scissorhands in Vincent as well, merging elements of the macabre with a family-friendly tale. Featuring poetic narration (written by Burton himself, in the same style as Poe’s The Raven) and stark black and white photography, Vincent is an absolute delight. You can watch Vincent in its entirety below, and I hope you enjoy it as much as I do. I love this short film. It's funny, creepy, heartfelt, and beautifully made. A gem. Thanks for the heads up I'll check it out.